The Oceanology International conference covers such a wide range of industries, all with the common mission of measuring, developing, protecting, or operating in the world’s oceans, providing lots of room for potential collaborations and idea sharing among market leaders. Being a conference with numerous offshore/subsea market leaders in attendance, it provides an opportunity for attendees to become inspired by new advancements within the industry and develop new customer relationships. Of particular interest to our team were new equipment and companies that acquire, transfer, and store data and analytics technologies. We also noticed many oil spill company leaders were in attendance, which was interesting to see the continuing developing partnerships and collaborations between the marine technology companies and the oil and gas sector. Through the bustling exhibit halls and between sessions, we had the opportunity to talk with multiple attendees about the economic status of some of these new markets. One thing most sector leaders agree on is that the market will eventually bounce back—but the one unanswered question is still a matter of when. Much of the conference buzz also surrounded themes around autonomous unmanned vehicles (AUVs,) oil spill equipment, remote operated vehicles (ROVs), and various new software opportunities pertaining to data management. The ever-growing capabilities of unmanned vehicles, along with industry applications, communications, and data are driving further advances in the ways that we collect information and work within the oceans. 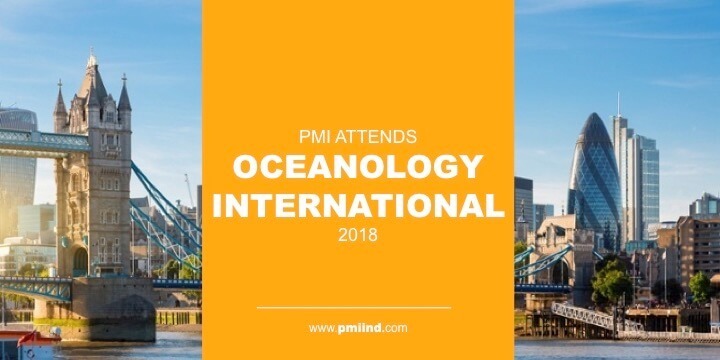 With nearly 500 exhibitors from dozens of countries around the world, Oceanology International gives PMI a unique opportunity to meet with companies and discover their innovative solutions to today’s marine technology challenges. It also provides a great opportunity to share about our innovative subsea cable technologies and to create new partnerships and collaborations. PMI is positioned well within this field given the application of various cable solutions such as our no tool or prep required cable strain relief systems (BSRs), synthetic cable terminations, and 3rd party cable testing capabilities which provide much needed services to the a wide range of markets who are associated with ocean work. Our custom cable subsea systems and deep subsea cable expertise explain why companies around the world count on PMI. When you’ve got a lot of ocean in front of you, you need PMI behind you. See you back in London for Oceanology International 2020!